An enjoyable trip to Peak Rail in Derbyshire didn’t produce any great photos, but a visit to their 2nd hand book wagon did yield a couple of 50 pence gems. First up was ‘Steam’ by Ian Krause, whose work I’d seen in the classic Ian Allan ‘Steam Portfolio’. It’s mainly steam in action, and some very good ones as well, plus a few alternative views. Of more significance was a book by Hans Steeneken called ‘All Trains To Stop’. Now I’d never heard of either the book nor the photographer before, but after picking it up and flicking through it, I was straight down to the till! Steeneken was actually a professional photographer, working for the Dutch electricity board, and his photos are superb, both aesthetically and technically. 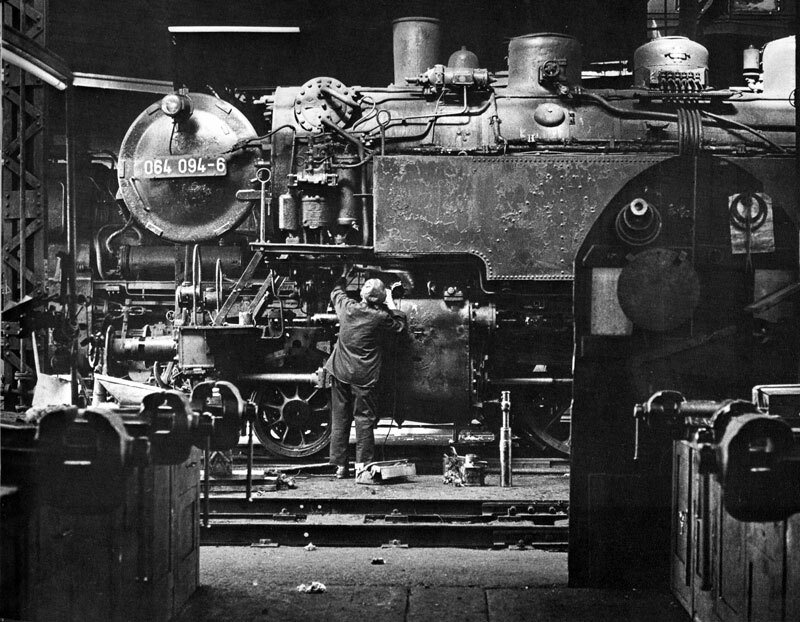 He travelled Europe in the sixties and early seventies photographing the last days if steam in Britain, Germany, France and Spain, producing over 30000 images. This must have been some feat at the time, as 30000 images is a lot of film! In some respects, his style is similar to the British progressive photographers of the 1960’s (lots of grime, atmospheric night and shed shots, drivers, panned shots of trains on the move, reflections, centre jour, etc) but it is the breadth and depth of the study which sets it apart from other books I have seen. In fact I’d go as far as saying that it’s the most definitive book of progressive railway photographs I’ve yet seen. I struggled to choose just a few photos to scan and include, there really are so many excellent photos to choose from. Plenty of copies are available on ABE Books on the internet, it’s well worth taking a look at if you like alternative photos of steam railways. Click on the picture below to go to Amazon to buy it! My thoughts exactly Hans. Rail enthusiasts and mainly interested in 3/4 sun over the shoulder shots that are as unlike real life as you can get. No people, no cloudy wet days, no industry etc etc. Publishers are rarely willing to risk a shot finacially and there is the problem. ‘All Trains To Stop’ is a fantastic book full of beuatiful and not-so beautiful shots. I have been heavily influenced by this and such works as ‘Decline Of Steam’, ‘Each A Glimpse’ and ‘On And Off The beaten track’ all well worth seeking out. There’s nothing wrong with ¾ view train photography as long as long as you don’t pad out a whole book with it. There is more in life, in railway life too. What about panned shots, backlit pictures, silhouettes, station scenes, night photography, signal boxes, shed scenes, repair work, people at work, grime and dirt, shunting, informal portraits of people, reflections in water, all sorts of close-ups, just hands doing something, still lives, dereliction, empty places, demolition, etc. etc. Long before Ian Allan came up with his ‘new approach’ there had been photographers in the US – like Link, Shaughnessy, Steinheimer and Hastings – who had showed their approach already. To trigger your fantasy check out their efforts at your local library but also look at the work of other famous photographers such as Dorothea Lange, Henri Cartier-Bresson, Bill Brandt, Sebastião Salgado and other Magnum photographers. Couldn’t agree more, Hans.I have admired Winston Link and Bill Brandt for many years. Another “forgotten” book well worth searching out is Jean-Michel Hartmann’s “Adieu Dampflok”, which I think surfaced in the UK in 1966 or 1967. Inspirational stuff. Yes Ian, I bought that book a long time ago. But before that he had another one called “Zauber der Schiene” also published by Franckh’sche Verlagshandlung, Stuttgart. I believe there should be a “Magie du Rail” as well, a french translation or the other way round. Refreshing and up to your taste could be Wolgang Staiger’s “Eisenzeit” from EK-Verlag, Freiburg. A superb book , which beautifully captures the last days of steam and done so from a different perspective , and one which I really enjoy reading . Despite having such known , highly regarded and excellent exponents of capturing something very different , railway photography still remains mired in a very front 3/4 perspective. I bought Hans Steeneken’s ‘All Trains to Stop’ on the recommendations here, and I never regretted that decision. The excellent photos are printed really well too, something that is not always the case in railway books. I took inspiration from Hans Steeneken in my own photography. I then sourced a copy of ‘Adieu Dampflok’ which I love. Thanks, I’m pleased that the recommendation has proved an inspiration to you. Hans had a huge body of work, it’s just a pity that he didn’t have any more books published before he died last year. Thanks, it’s sad in his passing away we may not see the other work, in particular the colour photos of Indian Railways. I recently picked up ‘The Imperial Way’ (1985) by Paul Theroux and Steve McCurry, a book describing the lines from Peshawar to Chittagong. It contains beautiful colour photos taken by McCurry. It concentrates on the wider social world of the railway, which I like an I feel is sadly missed by some railway photographers. However it contains one of my all time favourite loco shots, a steam loco slowly passing the Taj Mahal – magic!.